I love it when a sequel plays around with its original idea...with caveats, of course. Tweaks are good. Wholesale re-imaginings can be taking things too far. Take The Highlander, for instance. That film lays out some neat ground rules for both protagonist and antagonist. For some supernatural reason, seemingly random people throughout history have been rendered immortal, their purpose in life to track each other down and cut each other’s heads off, all to earn a mysterious prize which will be given to the last man standing. The film spent a substantial amount of time on its hero’s origin story in the Scottish Highlands. The film wrapped up the story so completely that the filmmakers may as well have put a bow on it. But, when it was time to make a sequel, all that backstory was retconned, and the immortals turned into fricking aliens. ALIENS. Audiences hated it. In A Nightmare on Elm Street 2: Freddy’s Revenge, screenwriter David Chaskin and director Jack Sholder lent their own visions to Wes Craven’s creation without destroying the character of Freddy Krueger in the process. In the previous film, fire-scarred demon Freddy Krueger invaded the dreams of local teenagers and killed them while they slept. That’s some imaginative stuff. How does one stop a killer who can kill a person in their dreams? Everyone has to sleep, eventually. But, in making a sequel, Freddy threatens to become a one-trick pony, like Michael Myers or Jason Vorhees, so the filmmakers wisely decided to try out some new ideas. 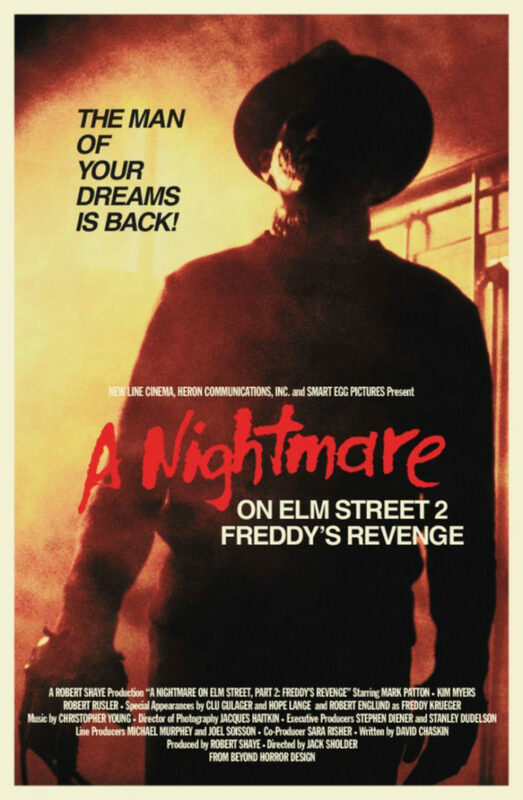 In Nightmare 2, Freddy can still haunt a person’s dreams, but he isn’t all that interested in killing in the nightmare world. Rather, he targets young Jesse Walsh (Mark Patton), who had the misfortune of moving into the house vacated by one of Freddy’s previous targets. Rather than kill Jesse, Freddy chooses to possess Jesse and use his body as a vessel to chase down his targets in the waking world. Why Freddy chooses to do so, and why he targets the people he does, is never explained. As best I can figure, Freddy is going after targets of opportunity. It doesn’t really matter, though. This movie was made so Freddy Krueger could kill people. As long as some poor folks are put in front of him, the film serves its purpose. The film doesn’t waste a lot of time getting going, another feather in its cap. There’s some exposition here and there, just to keep the plot somewhat grounded, but at 85 minutes long, there isn’t a lot of time to waste before the blood starts flowing. The audience is forced, however, to spend a lot of time with Jesse. Patton wasn’t miscast in the role, or anything like that. Rather, his character is somewhat repellant. From the first frame Jesse appears on screen to the last, he’s a bit of a whiny, moping teenager. Sure, it’s justified in his case, but there’s nary a moment when a little sunny cheer creeps into his life. We never get to see how Jesse was before Freddy started haunting him. The filmmakers missed an opportunity there to endear Jesse to the audience. By the time the film reaches its frenetic peak at the pool party, I wanted Freddy to be done with Jesse altogether and just be loosed on the world without having to go through his brooding conduit. Nightmare 2 is one of the more restrained films in the Elm Street series. The body count is lower than most, and Freddy had yet to go to the Henny Youngman School of One-Liners (which he failed out of, by the way). Freddy was more of a horror than a deadly jokester in this film, and that’s a good thing. Despite being a horror icon, most of the Elm Street flicks are just putrid. This one isn’t.